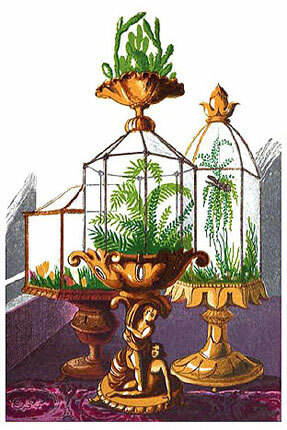 Wardian cases, or fern cases, were the forerunner of the modern terrarium - perfect for an indoor garden. 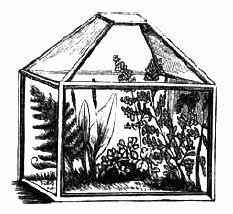 The Wardian case, or fern case, was the forerunner of the modern terrarium and a popular method of maintaining a small indoor garden. First introduced in London by Dr. Ward in the early 19th century, the Wardian case became a highlight of Victorian drawing rooms. Whether it was a grand or humble container, the Wardian case was the best reminder of the existence of the beauty of the outdoor world that could be had for all the seasons, close inside the home. When the woods were leafless, and the fields and gardens destitute of attractions, the little indoor garden still displayed emerald greens, russet browns, and gold and silver leafage -- safe from frost. The Wardian case forever hinted that the time was not far off when the woods will be robed again, and hundreds of flowers would spring forth. The exquisite beauty of a fine assortment of ferns skillfully managed and arranged in Wardian cases, may well account for the popularity of this class of plants during the late 19th century. 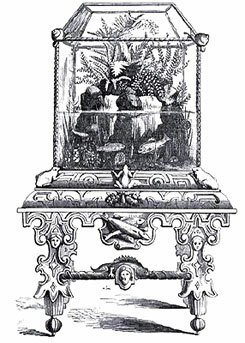 For the residents in towns, a fern case provided a means of securing a garden in the closest and smokiest localities. 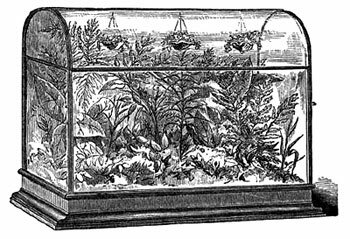 It was in the polluted coal-smoke cities, without a doubt, that the Victorian indoor fern garden was most precious. 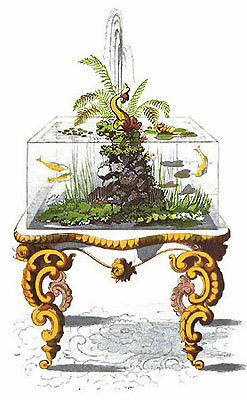 Left: Aquarium and fernery combined. The form and the dimensions of a Wardian case were determined by individual tastes and requirements. As a rule, the larger the construction of the fern case, the better, because an abundance of light and a large body of air were favorable conditions for the plants. It was also important that the indoor garden apparatus would be portable. 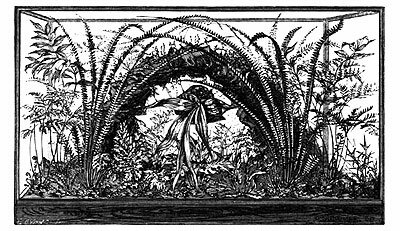 The simplest form of a fern case was a flower pot with a bell glass that fitted close down upon the soil within the rim of the pot, in which one fern alone was planted. Next to this was the “Fern Shade,” a contrivance consisting of a circular pan about a foot in diameter and six inches deep, having a narrow groove inside the rim for the reception of a glass shade. The exterior of the pan was generally adorned with rustic figures and covered with a brown glaze. 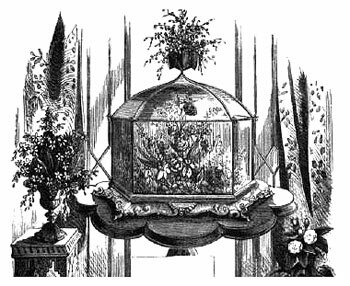 The glass shade was movable, thus affording easy access to the plants and permitting the necessary watering and airing to be carried out without much difficulty. Left: Bell glass with plants. Rectangular Wardian case with rockery and ferns. From fern shades, we next pass to plain fern boxes. The upper part consisted of five sheets of glass that fitted into wooden frames. The lower part of this box consisted of a trough, the under part of which was periodically filled with hot water, and the part immediately over was permanently filled with soil and planted with ferns. Large Wardian case with hanging shell baskets holding plants..
Victorian Wardian cases were larger and more decorative. There were a great variety of styles of Wardian cases on the market at the height of their popularity. In some, the stand or base consisted of wood, plain or ornamented, on which rested glass sides, ends, and top, connected by zinc or copper bars. The top or one of the sides was constructed so as to open and give access to the interior. 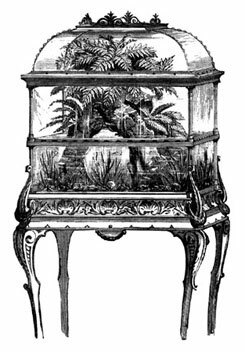 Other fern cases consisted entirely of zinc and glass, or had their bases of rustic rock, earthenware, or bronzed metal. They varied considerably in shape, also. Some were rectangular and plain; others oblong, with stands decorated with Minton tiles, and having gabled or curvilinear roofs; in fact, there were an infinite variety of styles, enough to suit all tastes and sizes of all purses. Left: Ornamental Wardina case stand for hall.